This Then & Now pairing shows the High Street in the mid 1960s looking down towards the direction of New Street. 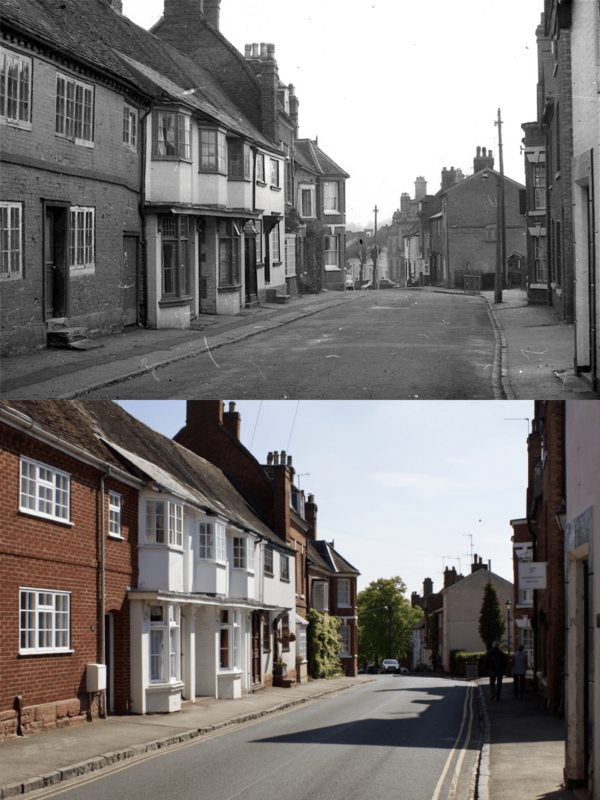 The scene is gratifyingly unchanged today, although the red bricked number 44 on the extreme left has been re-fronted since the original photo was taken. Every self respecting English market town should have a Red Lion pub, and Kenilworth was no different. The white buildings on the left, today numbered 38 – 42 High Street, were once the site of a pub of this name. Number 38 has a little metal red lion plaque next to its front door in memory of its former role. Rob Steward’s book The Inns and Roads of Kenilworth (Odiborne Press, 2000) provides some details on this lost pub. He records that there’s a mention of the ‘Red Lyon at Kenelworth’ on 1652 when the inn was used to host a meeting of the Justices of the Peace for Warwickshire to discuss the plight of wounded Parliamentarian soldiers who were unable to find work after the Civil War. By the time of the licensing records of 1850 the pub was no longer mentioned, so Rob states an assumption that the pub must have closed by then. Amongst the cluster of buildings on the right currently occupied by Pennington Dental, lies a property named Pennington House which was once a school for the poor. Joyce Powell’s book Kenilworth at School (Odiborne Press, 1991) records that in 1787 the late Thomas, Earl of Clarendon, left £200 for the poor of Kenilworth, which was lent to the Parish of St Nicholas to secure a mortgage for a poor house and a “School of Industry for 30 poor girls”. Robin Leach records in Victorian Kenilworth and its People (Rookfield Press, 2006) how the site was subsequently bought by a cabinet maker and upholsterer as his furniture warehouse in 1870. The site was then auctioned in 1878 to a Miss Jane Woodcock of The Firs for use as a convalescent home. The convalescent home’s logo can still be seen set in sandstone above the door of the later east wing, today numbered as 33 High Street. Amongst the contributors to the convalescent home’s funds was a Mr Pennington of Thickthorn, hence the name of the premises today. The door on the extreme right of both pictures is that of the old smithy at 39 High Street, which is being knocked down and rebuilt as a ‘Passivhaus’ eco home at the time of writing. Next door lies The Pound which was restored in 2015.